Our aim is to make every visit to the Penscot Inn special. Whether you are visiting for a quiet weekend, a special meal or a midweek drink we want you to have a memorable visit. 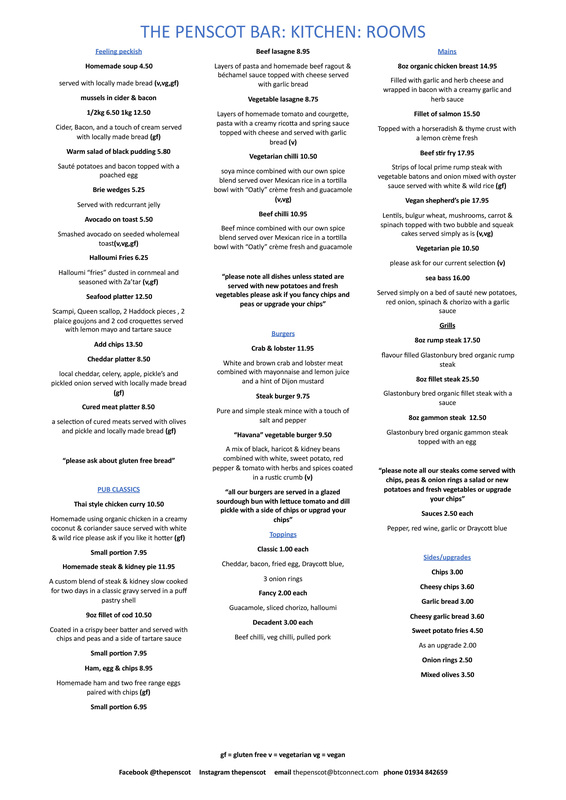 All our food is cooked to order and in many cases allowances can be made for food allergies and intolerances, please just ask and will do our best to help. Please note we cannot guarantee a nut free environment. Our meat and poultry comes from Somerset meat specialist Stephens of Glastonbury who provides us with amongst other things Beef reared in the shadow of Glastonbury Tor and Organic pork from Chilcompton. We have a wine list of individual wines from smaller producers provided by Enotria Wine to complement our menu, including de-alcoholised wines.